(SPOILERS) If you have the patience to go along with its unhurried, semi-slumbering pace, 45 Years may well creep up on you unawares. 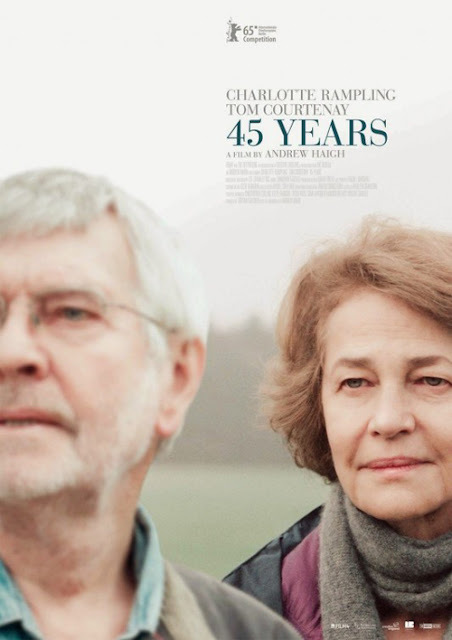 Writer-director Andrew Haigh nurtures the same seeds of doubt in the viewer’s mind that grow in Kate Mercer’s (Charlotte Rampling), as her inability to reconcile revelations concerning her husband Geoff (Tom Courtenay) leads to the unravelling of what appeared to be a very solid, very comfortable, very average marriage. The trigger is news that the body of Katya, Geoff’s girlfriend prior to meeting Kate, has been found in a melting glacier. Geoff becomes preoccupied with reminiscences of decades past and Kate is initially understanding of the situation, albeit jealous of the space this former lover held in her husband’s heart. But when Geoff admits he would have married her, starts looking into travelling to Switzerland to see the body, spends time in the attic going through old pictures, begins smoking again and drinking too much, the burden becomes too much and Kate instructs him not to talk about Katya any more. 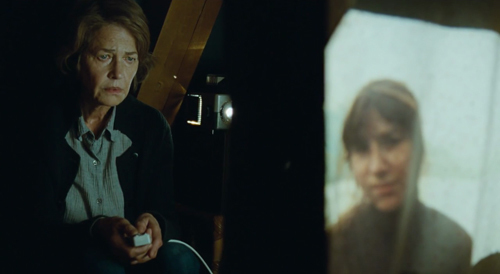 There’s something of the Michael Haneke about Haigh’s film, with its spectre of intangible secrets the viewer – like our protagonist – cannot grasp with any certainty. 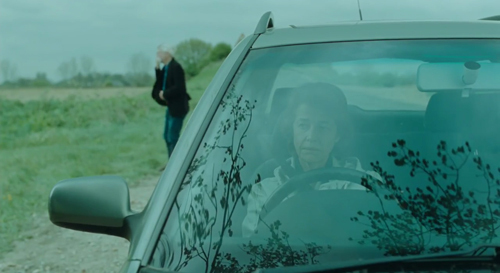 Initially, the underplayed narrative passes almost unnoticed, a non-descript depiction of a retired couple living unexceptionally in rural Norfolk; you wouldn’t be blamed for nodding off along with Geoff. But Kate’s increasing disturbance of mind gradually takes hold, and so Haigh cloaks the picture with an increasingly uneasy atmosphere, as the unrelinquished past encroaches on the present. It’s thus understandable that some have read more into Geoff’s exhumed history than is intended, namely that he may have murdered Katya, jealous of her flirtation with their German guide, and dumped her in a crevasse (so explaining his nervousness about the glacier melting and eagerness to take a look, lest evidence of his crime be discovered). I don’t think this is the case; rather, it’s evidence that, once the floodgates are opened, and deception preys on the mind, anything seems possible. It’s clear that Geoff has lied to Kate when she views the pictures of the trip on a slide projector; she isn’t wearing the wooden ring he talked about (as a pretence of marriage in a less tolerant time), and most damningly, one photo evidences that Katya was pregnant. 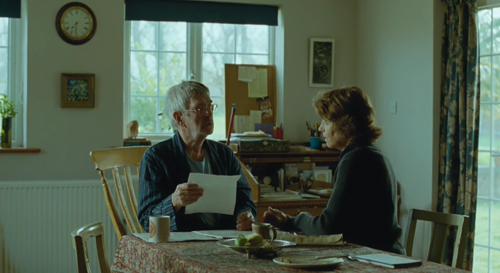 It’s this, rather than any more culpable acts, that is the turning point for Kate; the underpinning of their decision not to have children comes into question, and with it everything she assumed to be real between them. In tandem, Haigh infuses an almost gothic undercurrent. 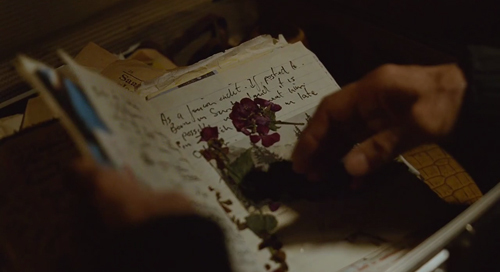 Kate is haunted by Katya’s presence, smelling her perfume, and, as she stands beneath the open attic during a nocturnal wander, the door behind her closes apparently of its own accord. But, even come their anniversary party (they didn’t have a fortieth due to Geoff’s bypass surgery), it isn’t wholly clear how affected she is. 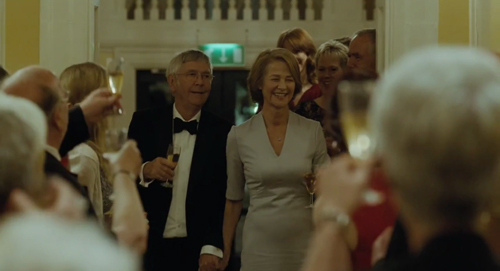 It’s only during the celebrations, as Geoff gives a speech (in which he breaks down, which he never does; earlier, Geraldine James has expressed the view that men always do on such occasions, “I think they just see the world differently to us”, but Kate notes he didn’t cry at their wedding), thanking her for putting up with all his nonsense, that her feelings become evident. Finally, during their dance, to Smoke Gets in Your Eyes, she pulls away from her husband when he holds her hand in the air; something has been irretrievably broken. 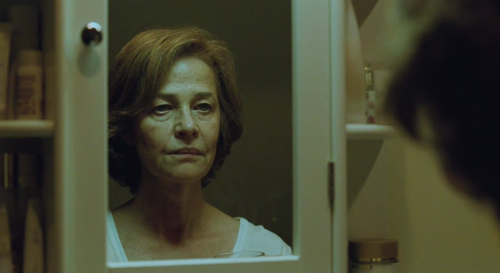 Rampling wholly deserves her Oscar nomination, probably her highest profile role since she embarked on an affair with a man in a chimp suit in Max, Mon Amour, navigating Kate’s inner conflict with subtlety and nuance. Courtney deserves great praise too, albeit his slightly incoherent, introverted partner is necessarily less readable. It’s Haigh, though, who is the real star of the show, gauging the picture expertly and precisely, leaving the viewer ruminating on events long after the credits have rolled.